This is the Constitution/Bylaws (Final Draft 2/18/01). a. The name of the Association shall be the International Wave Class Association (IWCA). a. To provide a medium of exchange of information among Wave sailors and to enhance the enjoyment of these sailboats. b. 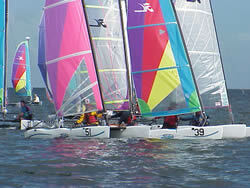 To promote and develop Wave class racing under uniform rules. c. To maintain the one design characteristics of the Wave sailboat. a. Any person whose IWCA dues are paid for the current year is a member. b. Entitled to one vote either in person, by absentee vote, or by proxy. i. Must inform the secretary in advance, via e-mail or in writing, of any vote if they intend to cast by absentee or proxy. c. Only IWCA members shall be entitled to compete in class-sanctioned events. d. Only IWCA members shall be entitled to vote on IWCA issues, or hold office. e. Membership is for one (1) fiscal year (Nov 15 -Nov 14) , and dues shall be set for the next year at the previous annual meeting by a simple vote. If there is no quorum to vote, dues shall remain the same as the prior year's level. Only Wave owners may hold office or be on the rules committee. a. At least one annual meeting shall be held on the first night of the US Nationals. In the absence of a US Nationals, the meeting will be held at the discretion of the class president. i. Special meetings may be held from time to time and can be done electronically with 15 days notice (web site posting). ii. Officer meetings may take place from time to time for the purpose of discussing class business and establishing class policy. b. Quorum: Shall consist of at least 50 percent of paid membership including any absentee ballots or proxy votes. i. If no quorum is present, a meeting for the purpose of informing the present membership may take place, with no "Official" business being conducted. ii. Absentee ballots must be in the possession of the secretary by the beginning of the meeting. 2. Vote on rule or bylaw changes. d. The officers and rules committee members shall be elected by majority vote at the annual meeting, including absentee ballots and proxy votes. The new positions shall take effect with the introduction of " New Business" during the annual meeting. i. If no quorum, the existing president may make appointments. 1. Preside at all general meetings. 2. Oversee the activities of the other officers and committees. 3. In the case a position becomes vacant, may appoint a substitute until the next scheduled election for that position. b. Report its finding to the officers by the annual meeting. c. Must have an end date upon creation. 5. Holds club elections and votes (except rules committee activities). 6. Decide on IWCA event locations and dates (3 member committee vote). 1. Shall promote the class. 2. Shall substitute for the President if unavailable. 3. Interface with the factory and report back to the class any relevant information. 4. Decide on IWCA event locations and dates (3 member committee vote). 1. Be responsible for the class minutes. 2. Maintain class membership information. 4. Receive class membership receipts and transfer them to the Treasurer. 5. Determine the class mailing address. 6. Is in charge of any class mailings and web site postings and membership notifications. 7. Assigns fleet numbers to any group of Wave owners who request it. 8. Be informed all absentee ballets or proxy votes prior to the vote by the issuing member. 1. Have custody of all class funds and make payments as necessary, on behalf of the class. 2. Submit a complete annual financial statement to the class no later then January 31 of the following year. 3. Provide periodic financial updates to the officers. 4. File all required financial paperwork on a timely basis. 5. Be responsible for the legal issues. 6. Prepare an annual budget. 1. Be responsible for keeping the class rules current and organize any proposed rule changes. 2. Act as a single voice of the rules committee to the officers and membership, except where noted. 3. To call and preside over the rules committee meeting. (Must have two of the three members in attendance with the third having been notified). 4. Monitor class rules and recommend changes to the committee (see 6.b.1.). 5. Issue and track sail numbers. 6. Decide location of national and international events (rules committee vote). 7. Authorize the Notice of Regattas (NORs) and approve the Sailing Instructions (SIs) for the IWCA events. 8. Assist the measurer in certifying class equipment. 9. Vote on whether to submit a rule change to the class (rules committee vote). 10. Decide on IWCA event locations and dates (3 member committee vote). b. The term of office shall be two (2) year terms and officers shall be eligible for reelection. Elections shall be held on even numbered years. c. Any officer may be removed from office by a majority vote of the balance of officers and rules committee membership for willful and unjustified gross act detrimental to the IWCA or its membership. d. Vacancy of any officer or committee member shall be filled, by appointment, by the president, for the balance of that position's term. a. Rules committee - Shall consist of a Rules chairman, Chief measurer, and an Event coordinator. 1. Is to monitor the class rules. 2. Propose rule changes to the membership, as they feel necessary. 3. Solicit national and international event locations. 4. Make temporary rule changes as the situation arises. b. Keep all class measurement information. c. Handle equipment violations i.a.w. RRS. d. Enforce the class rules. e. Answer questions and challenges relating to the measurement rules. f. Issue interpretations, which shall be binding until approved or rejected by the rules committee. g. Keep the rules committee apprised of any "gray areas" or other rules issues as they arise. h. Vote on whether to submit a rule change to the class. a. Receive or solicit petitions for class national and international events. b. Present to the rules committee, on a timely basis, all locations under consideration for any IWCA event. c. Vote on whether to submit a rule change to the class. iv. Any rules committee member may be removed from office by a majority vote of the officers and balance of rules committee membership for willful and unjustified gross act detrimental to the IWCA or its membership. i. The Purpose of this committee shall be to receive or solicit nominations for officer and committee member positions. ii. Is appointed by the president at the previous election. 1. May consist of up to three (3) people. iii. Shall create the ballot for vote. i. May be made at any regular or special meeting, providing there is a quorum, by a two-thirds vote of the membership present including absentee ballots or proxy votes. ii. Proposed changes must have been presented to the organization (via web site posting) at least 30 days prior to the vote and must be seconded by at least ten (10) current members. iii. Become effective during the "New Business" section of the current meeting, unless specified in the motion. 2. Reject the proposed change. 3. Modify the proposed change. 1. A Web site posting shall occur stating the proposed change, at least 15 days prior to the meeting. 2. A "YES" vote by a two-thirds votes of the membership present, providing there is a quorum, including absentee ballots and proxy votes at the annual meeting shall be sufficient to change the class rule. 3. To take effect on March 1st of the following year. a. A special meeting shall be held expressly for that reason. b. Consent of at least two-thirds including absent ballots and proxy voting to dissolve. i. Newly formed club such most closely represents this body. ii. Charitable organization for the benefit of promoting sailing as selected by the outgoing officers. The design and development of the Hobie Wave is directed toward a strict one-design class where the true test is between sailors and sailing skill, and not boats. Any alterations to the hull form, construction, equipment, spars, sails or running rigging as supplied by the builder except as is specifically authorized by these rules, are a breach of these rules, both in spirit and in substance, and are prohibited. 2.1 To keep each boat as equal, simple and cost free as possible by rigidly maintaining, without deviation, the one-design features of the Hobie Wave for class racing. 2.2 To encourage the use of racing tactics and sailing skills only to increase boat speed. 2.3 To have the boat appeal to as many people as possible. 3.1 The International Wave Class Association shall hereafter be referred to as IWCA. 3.2 Hobie Cat USA, Hobie Cat Europe and any of their licensees that are in good standing with respected licensors shall hereafter be referred to as Hobie Cat Co.
3.3 International Sailing Federation shall be referred to as the ISAF. 3.4 The International Sailing Federation Racing Rules shall be referred to as the RRS. The IWCA has the right to declare ineligible any Hobie Wave which does not conform to the spirit, objective and intent, as well as the letter of these rules and official drawing and specifications held by the IWCA. In the event the drawings are not held by the IWCA, they shall be held by the respective Hobie Cat Co. If you think you have found a loophole, read the preceding statements again. These are the basis of the rules and cover all areas not covered in the rules. Generally, if you cannot find it listed in the Rules, it is not class legal. If you are in doubt, check with the IWCA first. Approval must be in writing by the Rules Chairman or his designee. Only Waves manufactured by the Hobie Cat Co. are legal for class racing. Nothing may be changed or removed from any Hobie Wave that will in any way alter the structural integrity, design function, or built-in safety features of the boat. Changes that fall under the category of safety and strength shall have prior written approval. Approved changes are as follows: Stronger gudgeons, larger diameter wires , slight shimming of crossbars, and reinforced flanges not affecting water flow. Except as allowed in these rules, any changes or additions that in any way can be construed as speed devices are not class legal. 7.1 Each person on board shall carry a lifesaving device or PFD (Personal Flotation Device) approved by the recognized authority having jurisdiction. IWCA recommends that life jackets or PFDs be worn at all times. 7.2 A minimum 5/16" diameter righting line or webbing consisting of at least one 13 foot length of line or webbing, or two 7 foot lengths of line or webbing shall be securely attached to the boat and readily available on either side of the boat. 8.1 Hulls may be rubbed, waxed, sanded, built back up to original spec, or buffed in the normal process of maintenance. 8.2 No friction-reducing agents may be employed on the hulls, rudders, spars or sails. 9.1 Hobie Cat Co. supplied rudder castings shall not be modified except for minimum filing to improve fit and function. 9.2 Only Hobie Cat Co. stock and aftermarket rudder blades may be used as long as they conform to the original stock template. The minimum rudder weight is 3 pounds. 9.3 Shims may be installed between the rudder blade and rudder housing. 9.4 Shims may be installed between rudder pins, gudgeons and castings. 9.5 Shock cord and/or line may be tied around the rudder to help control rudder kickup. 9.6 The tiller crossbar is adjustable. 9.6.a The tiller crossbar may be placed on the top or bottom of the tiller connectors. 9.7 Any style tiller connection is allowed. 9.7 Rudder arms will not be modified except for changing the crossbar connection. Arms turned for the purpose of changing the rudder turning radius is not allowed. 9.8 Tiller extensions are allowed. 10.1 Sails may be manufactured by any sailmaker and must measure in accordance with the specifications at the end of this section. (See Measurement Information) Hobie Cat Co. manufactured sails built before January 01, 2001 will be class legal without measurement. Hobie Cat Co. sails built after January 01, 2001 will be measured via a measurement template using the class measurements. 10.2 The Wave was designed as a uni-rig, meaning mainsail only. Although the boat has an optional jib and optional spinnaker, neither will be allowed for the Hobie Wave one-design racing. Boats with the optional crossbar between the bows to which the jib attaches may remain on the boat for racing. No spinnaker poles are allowed. Luff ** : 18' 0" - 216"
Leech : 18' 6" - 222"
Foot *** : 7' - 84"
*Sail must have 5 battens. **The Luff shall be the highest point of the sail and no material shall exceed square to the leading edge of the sail. ***The foot is defined as a straight line from the bottom of the Luff to the bottom of the Leech and no material shall be allowed below that straight line except for a 3" allowance of material. 10.4 A sailor may not change sails during a race or regatta unless the sail has been damaged and is no longer usable. Permission to make a sail change must be received, in writing from the race committee PRIOR to the change being made. 10.5 All sails shall have the Hobie "H" registered trademark logo, which is the class insignia. 10.6 No mechanical downhaul adjustment device will be allowed -- no blocks or cleats (other than the non-mechanical horn cleats on the mast). The downhaul line will be limited in length to 8 feet. There are no restrictions on the amount of purchase, as long as the 8' line is used. 10.7 The sail shall not be hoisted above the top of the mast. 10.8 A clew plate may be added replacing the clew grommet. It may be placed vertically up the leech from the clew point, horizontally along the foot from the clew point, or angled. Only one clew plate is allowed. (Two plates attached together through the sail material is recognized as " a clew plate". 10.9 Sail reinforcement is open. 10.10 Sails will be made of any material. They will be made from a minimum of 1.0 mil and 3oz material. 10.11 A leech and foot line is permitted. 10.12 The sail will not be reefed in class racing. 10.13 Any sail batten material is allowed. The bottom batten will not be made of a material that can be construed as a boom. 10.14 Trampolines may be manufactured by any manufacturer and maybe "one piece" . The trampoline may be reversed. 10.15 The trampoline grommets may be doubled. 10.16 Trampolines must attach to the hulls and crossbars in the same configuration as supplies by the manufacture. 11.1 The minimum wire size is 3/32 inch . The wire may be increased in size. Bridle wire lengths may not be altered. The forestay and shrouds may be of any length. Forestay bridle connection must be either a shackle or chain plate. Bridle wires may attach to the bow eye strap by a shackle or clip. 12.1 Outhaul -- No mechanical outhaul adjustment device will be allowed. 12.2 Boom -- No booms will be allowed. 12.3 Trapeze -- No trapeze systems are permitted. 12.4 Mainsheet system -- Maximum purchase is 4 to 1. Any style blocks from different manufacturers are allowed. The mainsheet will be a minimum of 3/16" and be a maximum of 7/16". The mainsheet may be tapered. Any type/style line/rope is allowed. 12.5 The mainsheet system will attach to the clew grommet or clew plate. 12.6 The mainsheet system will attach to the eyestrap (see 12.3) on the rear beam. A line may be attached to the bottom block shackle and around the rear beam in the event the eyestrap breaks. 12.7 The Masthead Float will not be removed. The float will not be turned around backwards. 12.8 Telltales are permitted on the sail. 12.9 Telltales put on the side stays; forestay and bridle wires are allowed. 12.10 Bridle/mast wind indicators are allowed. 12.11 No mast rotation devices are permitted. The halyard will be used only for lowering and raising the sail. 12.12Hiking style pants are permitted. 12.13 Hiking straps may be padded. Hiking straps will not be adjustable while racing. 12.15 Chain plate covers are allowed. 12.16 No boom vang or barberhaulers are allowed. 12.17 Additional safety lines may be added. 12.18 Radios can be onboard but must be turned off at the beginning of the starting sequence. Radios may be turned on after the Wave has finished a race. 12.19 Mainsheet keepers may be installed on the trampoline. 12.20 Wave deckpads will be in the stock positions. (4). 12.21 A maximum of 2 inspection hatches per hull is class legal. 13.1 Advertising on the boat and sails is allowed per ISAF Advertising Code, Regulation 20. 14.1. Upon receipt of the membership application form and fee, IWCA will assign an official sail number. Sail numbers may be requested on first come, first served basis. Otherwise they will be issued in sequence. 16.1 The official course for the Wave Class will be a triangle, followed by a windward-leeward, with a downwind finish. The port end mark of the Start Line may be used for the leeward mark. The reaching mark should be set out at a disstance of 125% of the distance from the Leeward Mark to the Windward Mark. 16.2 Course "X" is the Wave Class experimental course. This course allows for a Leeward Mark set behind the Start Line.